LEAP clients have unlimited access to the following support resources. Get help with LEAP implementation through your LEAP consultant. Find answers through LEAP Community, HelpDesk or Online LiveChat. Make the most of LEAP through free training videos. Access LEAP certified consultants, bookkeepers and affiliates. Suggest new features or provide feedback to improve LEAP for your firm. Your dedicated LEAP consultant will help set your firm up with LEAP. This includes organizing data transition from your existing filing system or practice management platform to LEAP, installation, and training in LEAP for attorneys and staff charged with bookkeeping or creating automated firm-specific templates. Browse online help articles, step-by-step instructions, or post questions or feature requests. LiveChat consultants can provide you with prompt assistance, or further investigate your query as needed. You can access the LEAP Community from within LEAP or via community.leap.us. 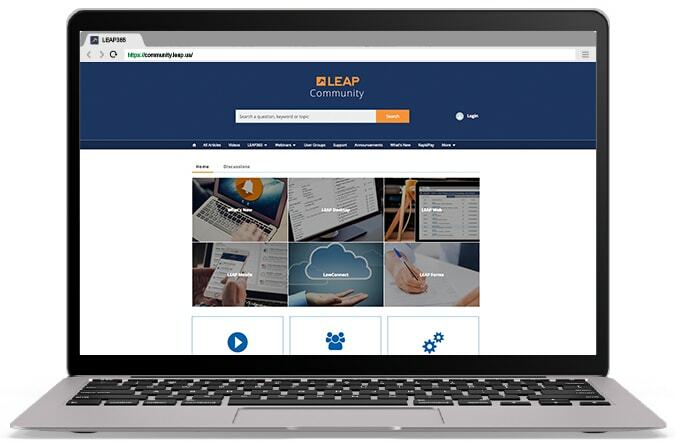 The LEAP team delivers free online training videos to provide ongoing training sessions for LEAP users. The Partner Network is comprised of independent Certified Consultants and Bookkeepers, and IT Partners. The network offers LEAP clients access to a range of additional support, training and consulting services. LEAP prides itself on being at the forefront of technological advancements and we welcome your feedback.